Design a unique hard case for your Sony Xperia Z5 Compact. Ensure protection and keep your phone stylish with this hard case. 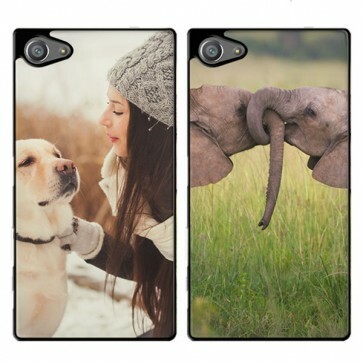 Pick a photo, create a design and let us print your unique case. A compact phone with a heavy punch and the case to fit. The Sony Xperia Z5 Compact is a great device. Almost equal power to its bigger brother version the Sony Xperia Z5 but half the size. Every great device needs a great case. A personalised hard case from GoCustomized helps protect your device and offers the perfect canvas for your customisable wishes. The entire back of the case will have your design printed on it. The sides will remain in the base colour black. Using the design module to make your case! Designing your own case has probably never been this easy. Our design module has been developed to ensure that you have all the tools you need to make a great case. Start by uploading an image. You can upload images from Facebook and Instagram in addition to images from your own devices. If you currently lack a little inspiration, check out our pre-made designs. These have been made by our in-house designers. Once you have chosen an image to use, you can reshape and resize it as you please. You can add some text using our text module. There are plenty of fonts and colours for you to choose from. Enjoy! I want it now, but how long do I wait? We strive to send each case within 24 hours. This means that your case is on its way to you within 24 hours of purchase. Our average delivery time is 5-7 working days. Please check our FAQs for more info.